A cream containing natural extracts of propolis, tea tree oil, and Aloe vera has been found to be more effective in reducing mild to moderate acne than a cream containing the synthetic antibiotic erythromycin, research published in Clinical Pharmacology: Advances and Applications shows. Antibiotics that suppress Propionibacterium acnes are the standard treatment for acne but are becoming less effective due to the emergence of antibiotic-resistant bacterial strains. Clinicians are also encouraged to prescribe fewer antibiotics overall due to the rising threat rise of antimicrobial resistance. Many plants are known to have innate antimicrobial action, so researchers are increasingly looking to see whether plant-based treatments might be an effective alternative to antibiotics. This study aimed to evaluate the efficacy of a new cream based on three natural extracts (propolis, “tea tree oil” and “Aloe vera”) in treating mild to moderate acne, comparing it to a cream based on 3% erythromycin and to its vehicle alone (placebo). The study was conducted at the Skinlab, Department of Biomedical Sciences, University of Sassari, Italy where 60 patients with mild to moderate acne vulgaris were randomly divided into three groups of 20. All patients were aged between 14 and 34 years; had no more than 20 comedones and 50 papules and pustules; no nodules, cysts, and no more than slight erythematous scarring presence; had not received topical or systemic acne treatments during the previous three months and had previously been responsive to topical erythromycin so were not resistant to it. Patients were excluded from the study if they were pregnant, lactating, in menopause, had polycystic ovarian syndrome, were taking oral contraceptives, had allergic contact dermatitis or sensitive skin. Patients in the first group were treated with the new cream containing the three natural extracts - 20% propolis, 3% “tea tree oil” and 10% “Aloe vera” (PTAC). Patients in the second group received the 3% erythromycin cream (ERC) and those in the third group received placebo. Participants were asked to use their allocated cream twice a day, in the morning and in the evening for a total of 30 days and to not use any other acne treatments. Severity of acne was assessed at baseline, and then after 15 and 30 days, by counting acne lesions through noninvasive measurements and macro-photography. There were no significant differences between the demographic characteristics of the patients in the three groups at the start of the study. 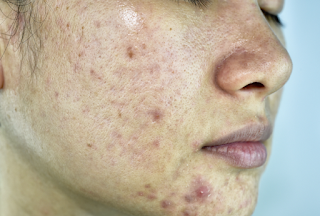 By the end of the study acne severity had improved in patients in both groups receiving active treatments compared to placebo, but patients receiving the PTAC formulation experienced a greater reduction in erythema scars, acne severity index, and total lesion count. Erythema in papular and scar lesions was more greatly reduced after 15 and 30 days of PTAC and ERC application than with placebo; the PTAC formulation was better than ERC in reducing erythema scars, but there was no difference between the two in reducing papular erythema.